Thanks for reading this issue of The ACW Story. This is our ninth issue, and the first of what we are hoping will be an awesome 2014 for both us and our readers. Did you know that Abraham Lincoln held a patent? Not only that, he is the only United States President to ever secure a patent for an invention! "...secured to the inventor, for a limited time, the exclusive use of his invention; and thereby added the fuel of interest to the fire of genius, in the discovery and production of new and useful things." - Abraham Lincoln, in 1859, on why he supported the patent laws. How Abraham Lincoln Set Out to Revolutionize River Travel. It all started in 1848, when Lincoln was on a steamboat making his way back to Illinois from a session of Congress in Washington D.C. During the trip, the boat was grounded on a sandbar, and only after much work by the crew of the boat were they able to get free and continue on their journey. 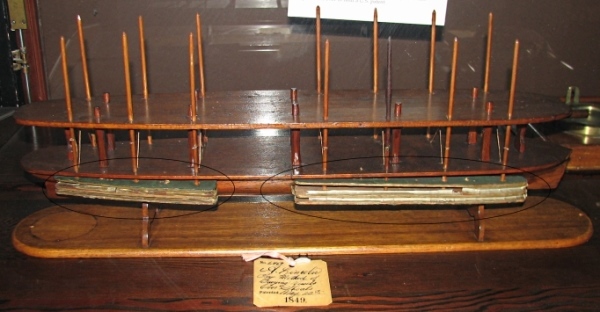 This inspired Lincoln to devise a mechanical means of floating grounded boats off of underwater snags. The model pictured above is the actual model he submitted along with his patent application in March of 1849, and he received his patent on May 22, 1849. Lincoln's invention was never put to use, but he is still the only President to ever secure a patent. Read the whole story on our website by clicking here. That page also includes Lincoln's entire patent application, and some amusing commentary on the entire episode from his law partner at the time, William H. Herndon. What was the name of the man who employed a young Abraham Lincoln to take a flatboat down to New Orleans? See all our new and updated articles anytime by visiting our "New Stories" blog here.